CHELSEA — Cracked sidewalks, slippery playgrounds and solar-powered composting stations went head-to-head at Chelsea and Hell's Kitchen's participatory budgeting expo Tuesday night. Proposals include a plan to turn a vacant lot at 136 W. 20th St. into a public park, resurfacing the sprinkler area at the Fulton Houses to make it safe for children, raised crosswalks, and bathroom renovations for public schools. Project proponents introduced their ideas to the public at the event at the Haskell Library on West 20th Street. 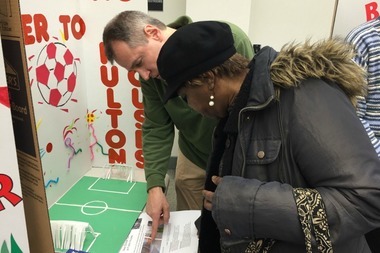 Fulton Houses resident Elaine Williams envisions a refinished basketball court at the NYCHA residence. “We want to make it a multi-purpose court,” Williams said, “and also a venue for artists.” She also imagines it could be covered with ice for skating in the winter. This is the first year that Council District 3 has tried participatory budgeting, a process that lets residents propose and vote on how to use $1 million or more in capital funds. City capital funds can be spent on infrastructure like construction and maintenance projects. Volunteers developed proposals for 17 projects, improvements for libraries, schools, parks and playgrounds, and streets and sidewalks. Voting will be held the week of April 11 through 19 at six community locations. At the expo, Johnson said that if great ideas didn't make the cut, he would try to make them happen anyway out of his own $5 million budget. "I basically am saying I don't have all the answers," he said. "This is democratizing the budget process." Patricia Whitfield, 62, has lived in the neighborhood for a 27 years, said she liked the park plan and things for the schools, but also felt the pull of loyalty to the Muhlenberg Library, which wants a new HVAC system. “I go there to get my movies,” she said. But Whitfield wondered why the city hadn’t already made some of the suggested fixes. “They were supposed to be taking care of these problems,” she said.